Increasing your stride length or rate can make you a faster runner. With running, you’re always interested in getting at least a little faster. Your speed is controlled by two things: the length of your stride and the rate of your stride. Increasing either of these things can help make you a faster runner. There is no set average stride length because everyone’s body is different, yet most runners’ natural stride length is their most efficient stride length. 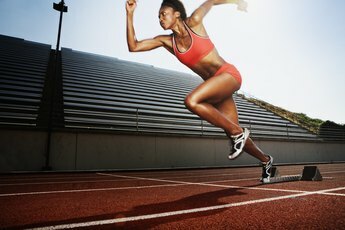 When trying to run faster, increasing your stride may not be the first thing you want to adjust. Forcing your body to lengthen its stride in an unnatural manner can make you less efficient. To determine if you need to lengthen your stride, pay attention to where your foot hits when you are running. Your foot should land directly under your body with a slightly bent knee. If your lower leg is landing in front of your body, your stride is already too long. If it is landing behind your body, then it’s time to extend your stride. Increasing your stride length is all about power. The stronger your leg muscles are, the more power they produce when your foot strikes the ground. With a powerful push, you gain more airtime, which equals a longer stride. 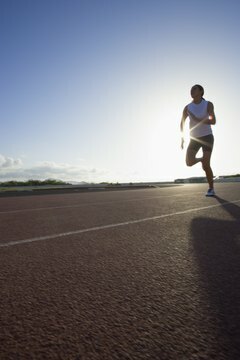 To calculate your stride length, run one minute on a track. While you run, count your strides. Now mark on the track where you ran to and calculate your running distance. Divide the number of strides into the distance to determine your stride length. The human body typically finds its natural stride length organically based on your leg power. With running-specific strength-training moves, you can increase your strength, which translates into a longer stride. A few moves that can help you build your strength include hill hops, quick hops, running on your toes, hill fartlek and boot camp hills. For the boot camp hills, run repeats on a hill that is 50 to 75 meters long. Do six repeats, alternating between sprinting up the hill and running with an extended stride. Jog back down slowly. Increasing your stride length should not decrease your stride rate; doing so would end up erasing any benefits of a longer stride. 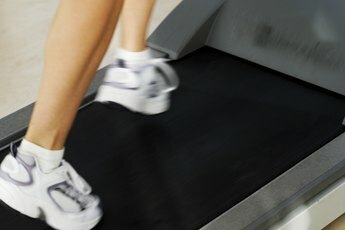 The average recreational runner takes between 150 and 170 steps per minute. Olympic athletes run with an average of 180 steps per minute. These elite runners don’t change how many steps they are taking to speed up or slow down; instead, they adjust the length of their stride, even when sprinting for a finish line. To increase your stride rate, warm up and then find a hill. Run down it aiming to hit 180 strides per minute. Allow gravity to accelerate your descent and increase your turnover to help you reach this number. Repeat four to six times. Does Working Out Your Calves Make You Run Faster? What Is the Longest Distance a Sprinter Should Run?